This page is designed to celebrate an American phenomenon which reflects an important part of US history and culture: the motel. The word showed up in dictionaries as postwar optimism and cold war pessimism led to the creation of an highway system. Before long, families began to discover bright neon arrows pointing the way to temporary homes dotting those long stretches of tar. Motels offered an inexpensive way to travel the country and expand our horizons. With this website, we wish to share our enthusiasm for this special and poignant part of Americana - one which is slipping into obscurity. In the race to build interstates which cut through the land without connecting us to its people, it is important to find a place to rest - even in cyberspace. Like the best journeys, this page has no particular direction. We have no roadmap for this trip. Nonetheless, we hope you enjoy the ride. 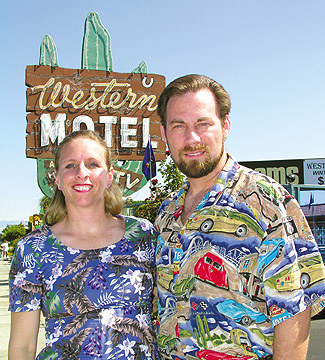 The authors and photographers of Motel Americana are Andrew and Jenny Wood. Andrew is an associate professor in the communication studies department of San Jose State University. Jenny works in a human resources department for a Silicon Valley disk drive manufacturer. We've run this website since 1995. We believe that the WWW offers an encyclopedia of human knowledge to which anyone may contribute. There are millions of sites out there on a virtually infinite array of topics. And the range and variety of topics seems to grow at an astronomical pace. But few sites in this internet age focus on the everyday, the mundane, the ordinary. So many folks are rushing to discover the Next Big Thing and ignoring so much of what's in front of us. Motel Americana is our attempt to slow down and look carefully at the world just beyond the interstate where so many people live their lives. Seriously, why do you do this? A bit much, huh? OK: We maintain Motel Americana because we love to travel, we love to shoot photos, and we love to write. Put 'em all together and just pick a topic, right? We chose motels largely on a whim a few years back, but have learned over time to be grateful for our nearly random choice of topics. Can I reserve a room at Motel Americana? We get emails of this nature about twice a month. Motel Americana is a website - not a real place or even a means to reserve rooms at other motels. We're hitting the road soon. Can you help plan our trip? Sorry, but we're not professional trip planners. We recommend that you check out Jamie Jensen's Road Trip USA and Mike Wilkins, Ken Smith, and Doug Kirby's Roadside America. Why haven't you visited (fill in the blank)? We love Motel Americana and add to it when we can, but we both have jobs and other commitments. Motel Americana has been a "work in progress" since 1995 and will never be complete. However, as the years go by, we plan to visit every great motel out there - and share 'em all with you. Can you put my postcard or photo on your site? We are not able to host your photos but are delighted to visit your website. How do you get those neon shots? Jenny writes: Taking pictures of neon signs is really not that difficult. If you have a camera that lets you set the exposure you only need to expose properly for the sign itself. I usually use the program setting and bracket some, just to make sure. If the program setting changes because the center of the viewfinder is not directly on the sign, you may want to use the manual settings and set them to what the program says is correct when the sign is in the middle of the frame. That way the setting won't change if you want the sign at the side of the frame. We're pretty cool about non-profit uses of our images, provided you email us for attribution information. If you wish to use a high resolution image for corporate purposes, we are glad to discuss that option as well. Send an email to wooda@email.sjsu.edu.